Greg Chappell retired from cricket after 87 Test matches, including 48 as captain, as the highest run scorer in Australian test cricket history, surpassing Sir Donald Bradman. This record was set in his final test at the Sydney Cricket Ground, a match that would also see him take his 122nd catch setting a new record for catches by fieldsmen. Chappell retired with the highest number of runs scored in a single Test match, 380. His four double centuries is second only in Australian cricket to Sir Donald Bradman and since World War two is the only player to score a century before lunch in a test match. Chappell is also the only Australian to score a century in each innings of a Test match on two occasions and the only Test captain to make a century in each innings of his first Test as captain. He is also the only cricketer to score a century in his first and last test innings. Chappell was honored by the Queen in 1979 with an MBE for services to cricket and inducted into the Australian Sport Hall of Fame in 1986. In December 2000 he was named in the Australian Test Team of the Century and was inducted into the Australian Cricket Hall of Fame in 2002. In 2003 he was named Australia’s fourth best cricketer behind Sir Donald Bradman, Shane Warne and Keith Miller. 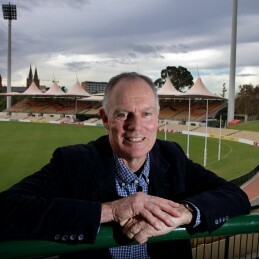 Since retirement Chappell has been a board member of Cricket Australia and Queensland Cricket. He also served as a selector for three years. Chappell’s media career has seen stints as a commentator with Channel Nine, Optus Sportsvision, World Tel and ABC radio. Chappell is currently the State Manager of Cricket for the South Australian Cricket Association, developing elite talent and coaching the Southern Redbacks. Chappell has a wide range of business interests including: health, technology, primary production, sporting goods and sporting memorabilia. Chappell is also a best-selling author with his health and lifestyle books. Chappell is a patron and board member of the Leukemia Foundation of South Australia having previously been a Trustee of the Leukemia Foundation of Queensland Capital Appeal between 1982 and 1992.